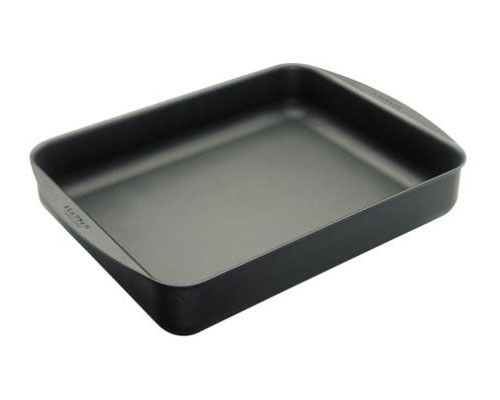 The Scanpan Classic Small Roasting Pan is the best non-stick piece of bake ware on the market. The perfect size to make lasagna and your favorite casseroles. The Scanpan classic line construction is squeeze cast aluminum encased in ceramic titanium. Nonstick surface guaranteed against warping. Oven proof up to 500F. Metal utensil safe. Measurements: 13.4 in x 8.7 in. Material: Squeeze cast aluminum encased in ceramic titanium construction, great heat retention, and no hot spots. The Scanpan Classic Medium Roasting Pan is the best non-stick piece of bake ware on the market. The perfect size to make lasagna and your favorite casseroles. The Scanpan classic line construction is squeeze cast aluminum encased in ceramic titanium. Nonstick surface guaranteed against warping. Oven proof up to 500F. Metal utensil safe. Measurements: 15 1/4 in. x 10 1/2 in. The Scanpan Classic Large Roasting Pan is large enough for any turkey or roast, and cleanup couldn't be easier.The Scanpan classic line construction is squeeze cast aluminum encased in ceramic titanium. Nonstick surface guaranteed against warping. Oven proof up to 500F. Metal utensil safe. Measurements: 17 1/4 in. x 12 3/4 in.